Gail has her degree in Medical Laboratory Science and worked many years in the fields of diagnostic microbiology, hematology and clinical chemistry. She followed this with over 12 years as scientific technical support director in the biotech, medical and pharmaceutical industries, working with many of the leading teams in medical and biotech research. Gail’s passion for science and medicine also lead her to a position teaching Anatomy and Physiology in the laboratories at the University of Massachusetts. It was during this time teaching where she really began to meld her passion for yoga with her enthusiasm for teaching others how to better understand their own body and ways to improve their health and well-being through the practices of yoga, nutrition, meditation and energy healing. As an instructor, Gail puts great emphasis on proper alignment, safe movement and the power of breath to improve one’s overall strength, flexibility and well-being. 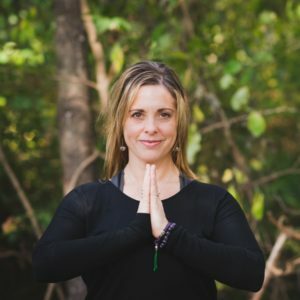 She has been teaching yoga since 2007, including children’s classes. With two children of her own, she has a deep love for sharing the art of yoga and meditation with kids. She believes that in teaching children various techniques to calm and soothe themselves, you provide them with tools for dealing with stress that will serve them for a lifetime. In addition to her teachings from the mat, Gail is also a master-level Reiki healer and Intuitive Medium. When she is not sitting with clients for healings, readings and spiritual counseling, she is teaching workshops in energy, psychic development and mediumship. As a clairvoyant medium, Gail is able to both see and communicate with Spirit, a gift she had from a young age. She did not come to fully embrace or develop this gift until adulthood, but will tell you that this ability and the profound clarity it has brought her life continues to shape each new day. Gail founded Windsoul Studio in October of 2013 with her husband Steve and their two children. You are sure to see her family around the studio sharing their love for the space and the practice of yoga with you and your family. Are You New to Our Studio?